Create a custom Wilson (R) golf ball package for your loyal customers, new clients and dedicated employees! With 5 various packaging methods the possibilities for personalization and customization are many. Whether you want a 3-pack of golf balls shrink wrapped for a sports convention or a 6-ball neoprene pouch to send for the holidays all you have to do is contact us to get the “ball” rolling. Golf news has always promoted 3 balls golf sleeves. Recycled golf balls are great for country clubs and hotel gift shops! Promotional products golf can be very useful in creating new business contacts in a four some on a golf course. 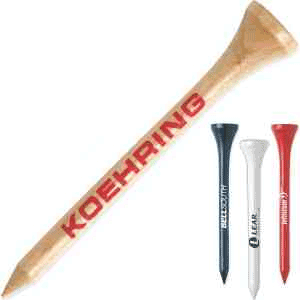 Tee Off Long Golf TeeTee off your next great marketing campaign with this golf essential! The long tee is made from top quality wood and measures 2 3/4″ in length. Price is under $1 EQP! Choose from a choice of 4 colors and customize further with an imprint on the shank of each tee. Also sold unimprinted. 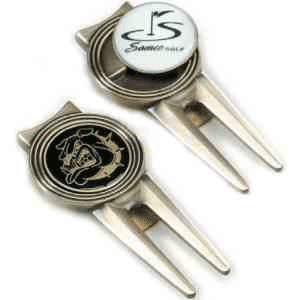 Custom golf ball markers make a great gift for the dad on Father’s Day, executives and other fans of the game. A Tiger Woods hole-in-one product to hand out at your next convention or tradeshow! This divot repair tool measures 2 3/4″, and comes with a belt clip and a choice of black or white marker. 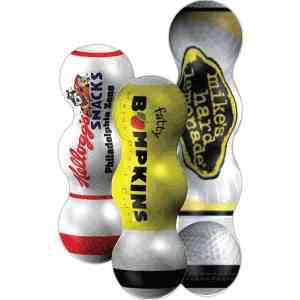 Makes a great promotional gift for country clubs, sporting goods stores and golfing events! Each tool includes a copy pad print in one standard ink color, and is available in antique bronze. Recipients won’t want to hit the course again without this handy tool. Precision Graphics online shopping offers many golf tournament and trade show give aways. Dimensions: 36.5″hWeight: 6.3 lbs./2.86kg Golf Towels Custom Golf TowelsPromoting and branding your companies name and logo is easy with Precision Graphics. Custom create personalized golf towels for your golf tournament or charity event? At Precision Graphics you can design custom logo towels online screen printed or embroidered and have them delivered right to you. Shipping is always free in the continental US and your order is guaranteed in 14 business days. Logo golf towels are a cheap way to show off your companies brand recognition and at Precision Graphics we can do one or thousands. Nike golf polos achieve superior performance in this new polo crafted with Dri-FIT moisture management technology. Distinct shoulder stripes offer visual impact. Features a self-fabric collar, three-button placket, open hem sleeves and side vents. The contrast Swoosh design trademark is embroidered on the left sleeve. Made of 4.4-ounce, 100% polyester Dri-FIT fabric. Precision Graphics staff custom embroidery on all nike golf polo’s. At Precision Graphics we use the lastest and most state of the art embroidery machines. A beautiful and luxurious addition to any wardrobe. Subtle ottoman texture meets the unrivaled performance Dri-FIT moisture management technology. Engineered with a bonded self-fabric collar for classic refinement. Five-button placket. Heat transfer label for tag free comfort. Pearlized buttons with metal rims. Open hem sleeves. Tailored for a feminine fit with an upper back pleat and contrast heat transfer Swoosh design trademark on the left hem. Just like the player on the PGA Golf courses. 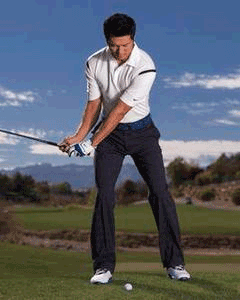 Men’s and womens golf clothing. Made of 5.61-ounce, 87/13 polyester/spandex Dri-FIT fabric.